(Including the essay “Death and Translation,” first published in Representations 94. This volume examines translation from many different angles: it explores how translations change the languages in which they occur, how works introduced from other languages become part of the consciousness of native speakers, and what strategies translators must use to secure acceptance for foreign works. 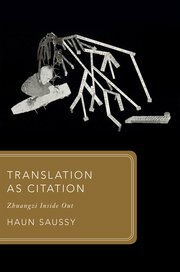 Haun Saussy argues that translation doesn’t amount to the composition, in one language, of statements equivalent to statements previously made in another language. Rather, translation works with elements of the language and culture in which it arrives, often reconfiguring them irreversibly: it creates, with a fine disregard for precedent, loan-words, calques, forced metaphors, forged pasts, imaginary relationships, and dialogues of the dead. Creativity, in this form of writing, usually considered merely reproductive, is the subject of this book. The volume takes the history of translation in China, from around 150 CE to the modern period, as its source of case studies. When the first proponents of Buddhism arrived in China, creativity was forced upon them: a vocabulary adequate to their purpose had yet to be invented. A Chinese Buddhist textual corpus took shape over centuries despite the near-absence of bilingual speakers. One basis of this translating activity was the rewriting of existing Chinese philosophical texts, and especially the most exorbitant of all these, the collection of dialogues, fables, and paradoxes known as the Zhuangzi. The Zhuangzi also furnished a linguistic basis for Chinese Christianity when the Jesuit missionary Matteo Ricci arrived in the later part of the Ming dynasty and allowed his friends and associates to frame his teachings in the language of early Daoism. It would function as well when Xu Zhimo translated from The Flowers of Evil in the 1920s. The chance but overdetermined encounter of Zhuangzi and Baudelaire yielded a ‘strange music’ that retroactively echoes through two millennia of Chinese translation, outlining a new understanding of the translator’s craft that cuts across the dividing lines of current theories and critiques of translation.